Please select 26" x 81" 28" x 81" 30" x 81" 32" x 81" 34" x 81" 36" x 81" 40" x 81" 47" x 81" 26" x 84" 28" x 84" 30" x 84" 32" x 84" 34" x 84" 36" x 84" 40" x 84" 47" x 84"
Product information "Single Sliding Barn Glass Door SGD-V2000-0025"
A sliding glass barn door separates rooms from each other, provides privacy and is space-saving. Annoying door slamming is a thing of the past, as this sliding door runs over smooth-running rollers. 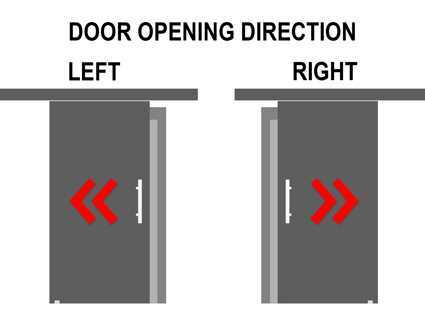 The door is easy to install, durable and robust. All the designs shown in our website are available for all of the products. We also customize designs and doors. This 1-leaf sliding glass barn door is delivered with an easy-to-install Euro Slider V2000 sliding system. All our sliding doors are 'top hung' which means the door is hung into the top rail with two trolley hangers; all the weight is taken by the hangers, making the door easier to move. The guide rail is made of strong, stainless steel and is therefore rust-free. All our doors are made of toughened/tempered glass. Tempered glass is a type of safety glass processed by controlled thermal or chemical treatments to increase its strength compared with normal glass. Tempering puts the outer surfaces into compression and the interior into tension. Such stresses cause the glass, when broken, to crumble into small granular chunks instead of splintering into jagged shards as plate glass (annealed glass) does. The granular chunks are less likely to cause injury. A sliding glass barn door gives your room a special and elegant flair. The maintenance-free ball bearing runners ensure extremely smooth running - even after many years of intensive use. Floor guide and guide rail provide stability and prevent unpleasant swinging. The included handles make it easy to open and close the door. The installation of the sliding door is easy even for inexperienced hobby craftsmen. The complete mounting accessories including high-quality screws and dowels are included. The sliding system can be attached directly to the wall or via a door frame. Each delivery contains a detailed installation manual. Add 2" inches to width and height e.g. your wall opening is 30" x 80" inches so your door dimensions should be 32" x 82" inches for a perfect fit. Please note that each door is made especially for you, for this reason our delivery time is 25 - 35 business days. Whereas we will try to ensure compliance with any delivery dates given, dates are an estimate only. In case of delays we will inform you immediately. To keep the shipping costs as low as possible we send the door and the hardware with 2 separate deliveries. Please call to inquire about local pick up! Related links to "Single Sliding Barn Glass Door SGD-V2000-0025"
Customer evaluation for "Single Sliding Barn Glass Door SGD-V2000-0025"
Subscribe to the free Glass-Door.us newsletter and ensure that you will no longer miss any of our Glass-Door.us offers and news. © 2019 OTTO & SOHN USA INC - All rights reserved.